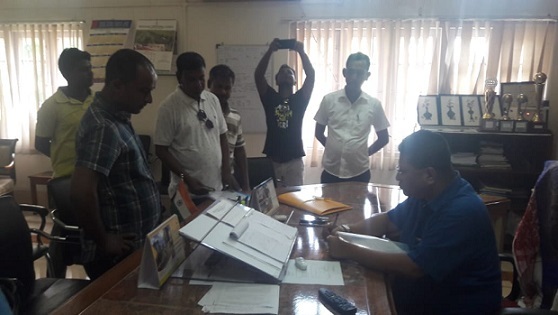 The Kokrajhar District Committee of the All BTC Minority Students’ Union (ABMSU) submitted a memorandum to the Joint Secretary to the Government of India (Northeast), Ministry of Home Affairs, Registrar General of India, through the Kokrajhar Deputy Commissioner on Monday seeking publication of a free and fair NRC. Jaidul Islam and Amir Ali, president and secretary of the All BTC Minority Students’ Union (ABMSU) in the memorandum stated the authority concerned has circulated that the persons whose names have been left out in the final draft NRC would be able to file applications before their respective NRC Seva Kendra (NSK). “Many people, whose names have been dropped from the final draft NRC are poor, illiterate and unaware about the law as well as the procedure hence asking such people for filling application to know the reason of exclusion is unreasonable and unjustified,” the memorandum stated. “The descendants and family members of D voter who are eligible as per sections of citizenship act 1955 should be included in the NRC,” the union demanded. Islam and Ali also said that a large numbers of poor, illiterate persons who are laymen have been excluded from the final draft NRC, such persons are not aware about the legal procedure and existing norms in respect of preparation of the NRC. “So the advocate and or authorised person shall be allowed for such persons during the course of verification and hearing,” Islam and Ali added.